In 1994, The Federation of Chefs Scotland (now Scottish Chefs) was formed thus establishing Scotland’s National Association for Chefs. 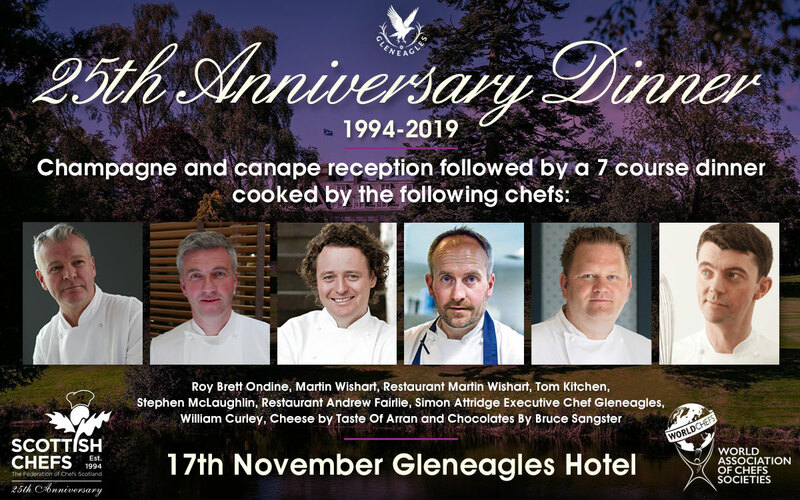 2019 marks our 25th Anniversary and to celebrate this unique occasion we are hosting a 25th Anniversary Gala Dinner at Gleneagles Hotel on Sunday 17th November. Some of Scotland’s finest chefs including Roy Brett, Tom Kitchen, Martin Wishart, Stephen McGlaughlin, Simon Attridge and Willie Curley will prepare the 7 Course Dinner. The Dinner will be preceded by a Champagne Reception, and accompanying wines will also be served . Tickets are priced at £150.00 and enquiries and further details including reservations should be made by contacting JMD Events – email Amanda: amanda@jmdeventsltd.co.uk or Judith: judith@jmdeventsltd.co.uk. Sponsorship packages available please email for options.